The first railroad maps printed in the United States? John Purdy / Published by Ja[me]s Whittle and Rich[ar]d Holmes Laurie / Engraved by Thomson & Hall, 14 Bury Str. Bloomsb[ur]y , A MAP OF CABOTIA; Comprehending THE PROVINCES OF UPPER AND LOWER CANADA, NEW-BRUNSWICK, AND NOVA-SCOTIA, WITH BRETON ISLAND, NEWFOUNDLAND, &C. And Including also THE ADJACENT PARTS OF THE UNITED STATES. 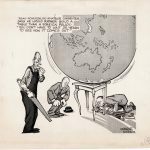 Compiled from a Great Variety of Original Documents. BY JOHN PURDY., No. 53 Fleet Street, London, October 12, 1814	. Engraving on four untrimmed sheets, if joined yielding a map 48 ¼"h x 61 ½"w at neat line, original outline color. The first state of John Purdy’s important, monumental and rare map of Cabotia (Canada) and the northeastern United States. This example is unusual for surviving in four unjoined sheets, in excellent condition with superb original outline color. Purdy’s Cabotia was for its time the largest-scale and most informative map of the region. It is a tour de force of compilation and synthesis from sources including Canadian maps by Cary, Chewitt, Des Barres, Holland, Jefferys, and Smythe (Malinksi, pp. 86ff), and maps of the United States by Arrowsmith and/or Bradley. The result is exceptionally detailed, especially in its treatment of the lands adjacent to the St. Lawrence River, the much-disputed U.S.-Canada boundary, and roads and settlements throughout. One of the more interesting features is the contrast between the narrow seigneurial grants reflecting the quasi-feudal system established by the French along the St. Lawrence, and the ten-by-ten-mile townships established by the British after their capture of New France. It provides fresh cartographic information in the Maritime Provinces, particularly in New Brunswick where Purdy drew much information from unpublished manuscript maps. The map also includes eight insets, most being larger-scale maps of important regions such as the Maritimes, the St. Lawrence Valley, and the Niagara frontier. Numerous notes offer Purdy’s own opinions (regarding for example the “the injudicious application of the name of St. John to three places”); recommendations (e.g., for a light house on Sable Island); and a long biographical note about the eponymous John and Sebastian Cabot. The map is free of explicit political or geopolitical commentary, but its initial publication during the War of 1812 and the unusual choice of geographical coverage invite interpretation. It may have been intended for use by British administrators and war planners, and/or by its commissioners at Ghent for reference during the complicated negotiations. A more provocative interpretation–though this writer has so far found no evidence directly supporting it-is that Purdy was subtly emphasizing the geographic unity of the region and raising the possibility of a “Greater Cabotia” incorporating much of the northeastern United States. The Cabotia was of sufficient importance that it was reissued in 1818, 1821, 1825, 1828 (twice), 1838 and, after the maker’s death, in 1850. In the final two states the title was changed to Map of the Vice-Royalty of Canada, the name “Cabotia” apparently no longer useful in selling the map. 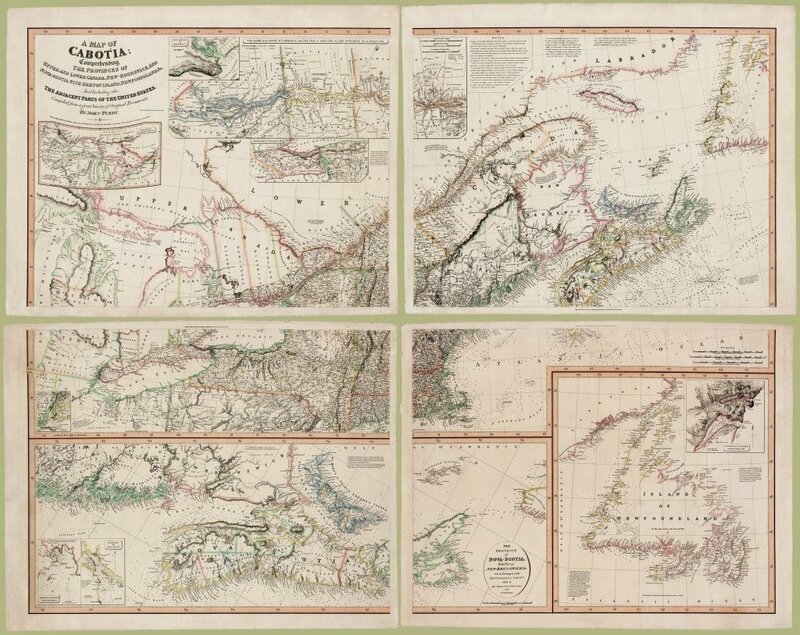 Purdy’s map was one of three major Canadian maps to appear in a relatively short period, the others being David William Smith’s 1800 Map of the Province of Upper Canada and Joseph Bouchette’s 1815 Map of the Provinces of Upper & Lower Canada. 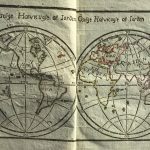 Whereas the Smith and Bouchette maps were issued to accompany books with further descriptive text, Purdy’s Cabotia was produced and published to be a separate commercial undertaking, with considerable information in the many text notes present throughout. Its success as an attractive, useful map is clearly seen by the fact that it was reprinted, with revisions, so frequently over the following 40 years. None of these three maps stands alone as the definitive map of Canada of the era. Collectively, however, they present a true picture of Canada during this critical period in its history. In addition to several volumes on navigation, Purdy produced charts and maps covering many parts of the world. An exhaustive discussion of the map’s physical features and comparative cartography may be found in Richard M. Malinski`s graduate thesis, “The Importance of the “Map of Cabotia” in the Early Nineteenth Century Mapping Sequence of Eastern Canada” (1973). Holmden, Catalogue of Maps, Plans and Charts in the Map Room of the Dominion Archives, #299 (listing 1838 issue only). Karpinski, Printed Maps of Michigan, #28. Malinski, “Cabotia,” state 1. Phillips, List of Maps of America, p. 195 lists 1821 and 1825 editions at the Library of Congress. Rumsey #3828. Stevens & Tree, “Comparative Cartography,” #8 (1814, 1821 and 1825 editions only). Verner and Stubbs, The Northpart of America, #15. Winearls, Mapping Upper Canada, #48. As of January 2014 OCLC lists 20 complete examples of the map in various editions. Of these, 10 are held by the British Library, 6 by American institutions (Cincinnati Public, Newberry, New York Public (2) and University of Virginia (2)), and 2 in Canada (Library of Parliament, Dalhousie University). The McMaster Library holds another example of the 1814. Minor soiling and marginal mends, else excellent.